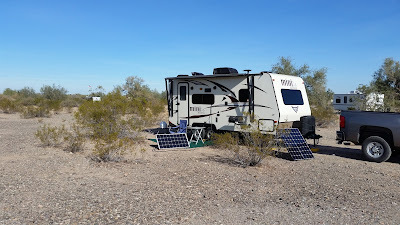 I made it out to Quartzsite, actually the Long Term Visitors Area (LTVA) a couple miles south of the town. 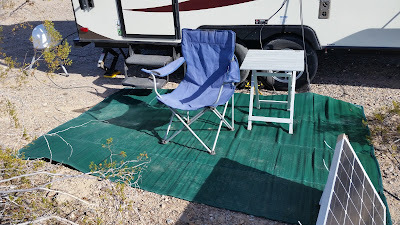 I rolled in on the Wednesday before the RV Show and found a middling campsite, not as good as some I've had but with people still streaming in today (Friday) I bet a lot of folks are staring at my site enviously. The Mini's campsite in the LTVA, note another RV is visible in the background. When the first wave of campers come into the LTVA, probably in late December, everyone tries to not infringe on existing campers' sites by keeping generously spaced out. As the RV show approaches and masses of more campers come in the RV's are packed closer and closer together. I might come in a week earlier next year if I do come, to get a more secluded site. 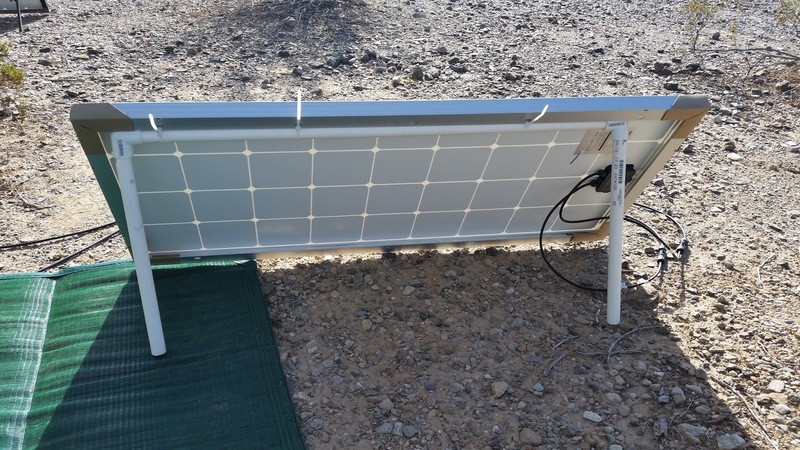 The new Renogy 100 watt solar panel with "custom" stand. 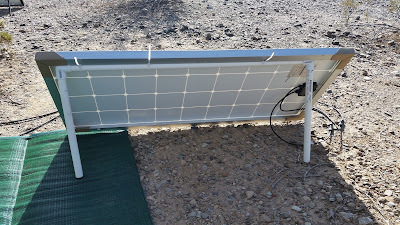 The new solar panel I bought for the solar generator is performing very well. I stopped at a Tucson Home Depot and bought some 3/4 inch PVC pipe and a couple 45 degree angles and crafted a simple stand for it. Closeup of the stand secured to the panel with cable ties. 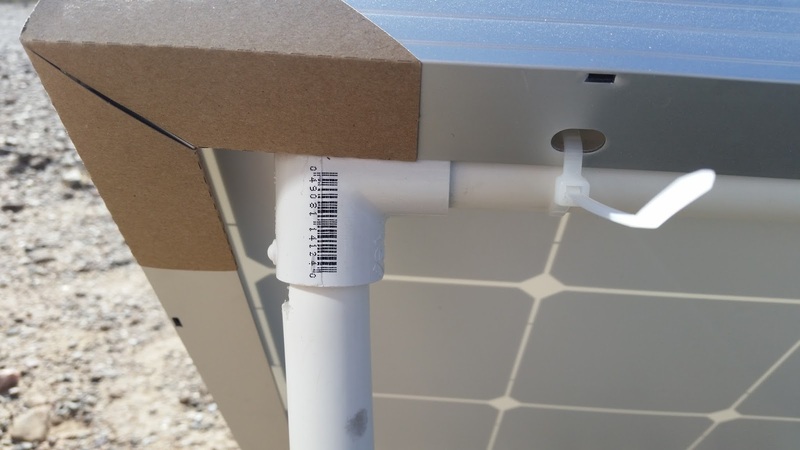 I use the 200 watt solar suitcase to keep the Mini's 12 volt deep cycle battery topped off. I charge all my electronics and run my laptop off that system during the day and let the solar generator run the TV and Dish set top box at night. I've tried the awning deflappers I got from Amazon and they do reduce the awning's flapping, but I haven't tried the awning stabilizer system yet because it hasn't been at all windy...yet. The awning rug is performing really well, allowing sand I track on it to fall through it's mesh and staying relatively clean on the surface. I only sweep the Mini about once a day so that's a huge improvement over the last time I was here -- the rug must be helping. 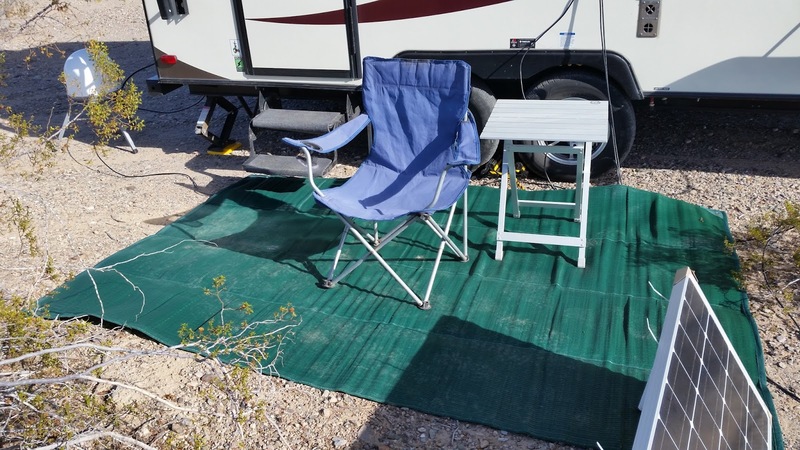 The new awning rug -- Spartan green, of course! I'm debating actually going to the RV show. I read an article that said Doctors have found that the flu virus can be transmitted by normal breathing, in addition to coughing and sneezing. 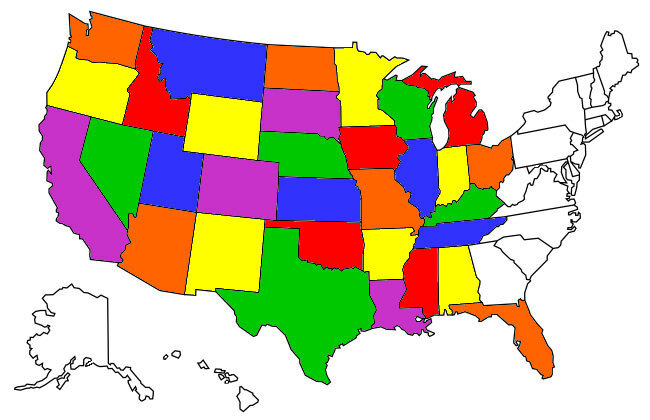 Arizona is really getting hit hard by the flu and with 100,000 people packed into the Big Tent at the show I think the odds of getting the bug go way up. If I do go it'll probably be on one of the show's last days when hopefully things have thinned out.